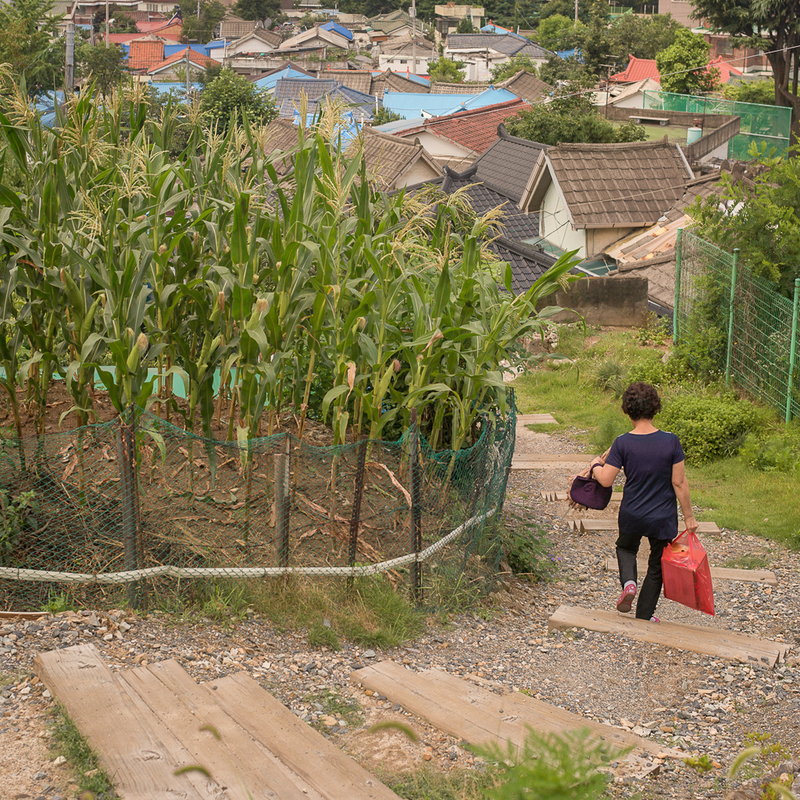 On one of our afternoon walks this week, Suhee instinctively found where the action was at in this small neighborhood. 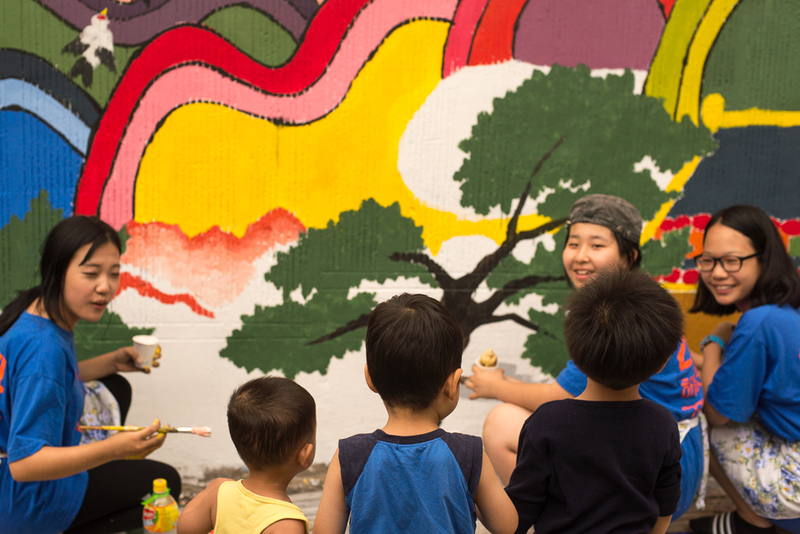 As part of a contest, local painters and student groups took to the streets for a weekend to enliven this old neighborhood with color. 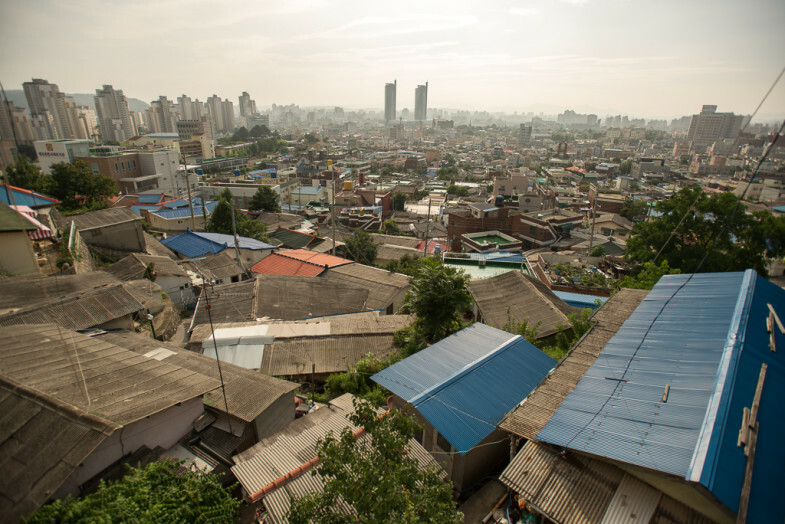 To give a bit of context, Daedong is a economically ‘poor’ neighborhood where the population is mostly made of the elderly, retired, and young families. On first reaction to seeing photographs of this place, many friends in the U.S. have said the neighborhood looks scary. In fact it kind of does; many of the buildings are showing their age and parts of it look abandoned; if it were physically transplanted to sit within the Western perspective of what a neighborhood should be, it wouldn’t score all too favorably. I joked with a friend here recently that if this type of neighborhood were in the U.S. I would not dare walk through it, even in broad daylight. It wasn’t really a joke though. Despite this, twenty one days into our residency here, Daedong has been a great place to be in. Mostly this is because Korea is just generally a very safe place, but a lot of it also has to do with the warmth of the people in this town, the way they take care of the streets, cleaning, sweeping, chatting, making it a place which, although maybe a bit sleepy, is still very alive. The residents take good care of their environment and they also garden just about every place they get the chance. Almost no plot of soil, no matter how tiny, is left without tended plants, whether it be flowers or a few corn stalks. The city has fitted the narrow streets and alleys with tiny playgrounds, small areas to sit, cool off and socialize, none of it is grand, but it needn’t be. The spaces are scaled to the neighborhood, which is one of supremely human scale. The car is here of course, but it is always made to feel awkward. The scale and seemingly-hectic layout of the neighborhood accomplishes this, and it is quite the opposite of what most American cities aim at. It might seem like a small distinction, but building with human-scale in mind is a detail which can have such a huge impact on the feeling of a neighborhood, not to mention the utility of space. 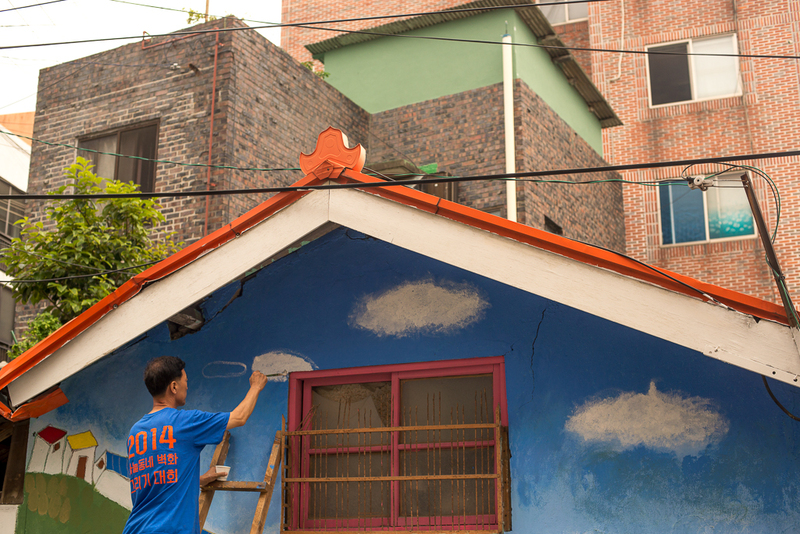 And then, one of the cornerstones of the neighborhood is the community welfare center. It hosts activities for locals, dance lessons, exercise, social events, and they also coordinated the street painting activities that we happened upon during our walk. 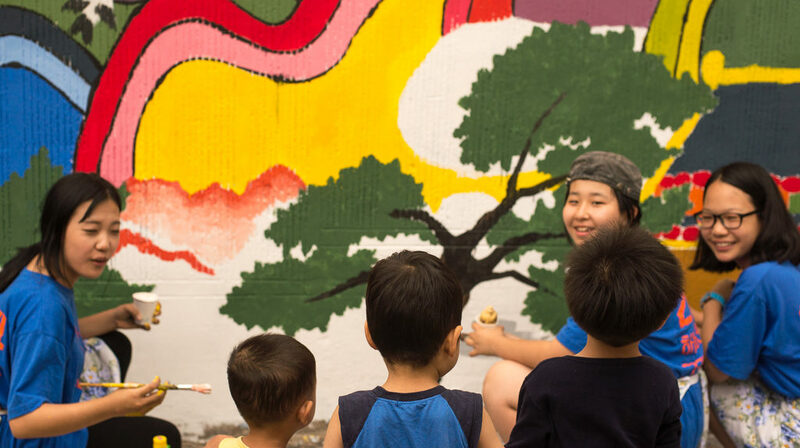 The painting not only brought creatives into the neighborhood, it also started dialogue between neighbors, which seemed to be a mix of smiles, thank-yous, competitive admiration, and the odd self-appointed ‘art director’ (usually a strong, old woman) who gave critical reflection during the process. 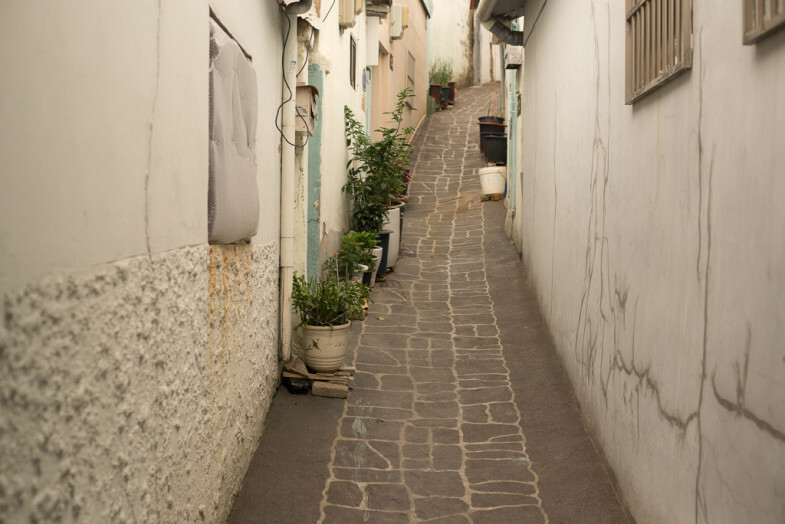 Still, arguably better than the typical quiet street with decades-old white paint chipping off of walls. There are a lot of things to learn here, about the structure of a community and how it fits together. Some of these lessons are matters of physical structure, while others — a majority, maybe — are cultural lessons. If you want to know how someone can live in a monetarily ‘poor’ urban neighborhood and have a good quality of life, there are undoubtedly some answers to be found here. 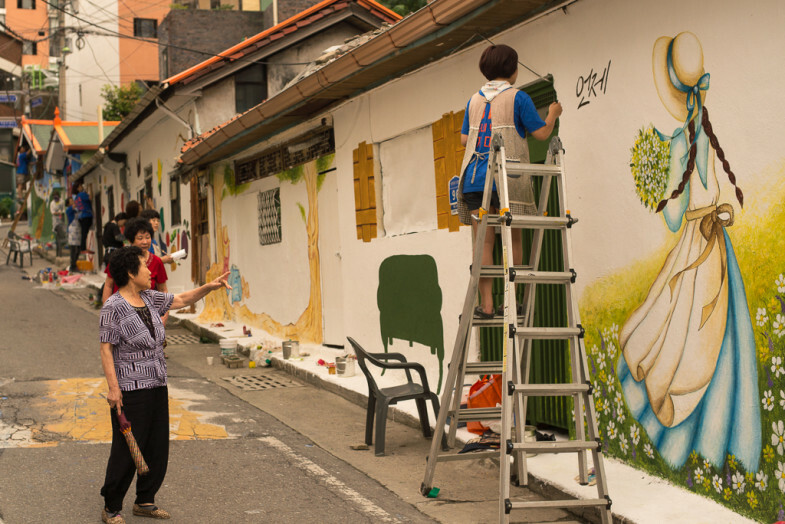 Painting on the streets might not be an answer in itself, but it is one of the many indications of a local government and people who know that ‘quality of life’ need not be directly linked to high income, and are applying it to their actions.